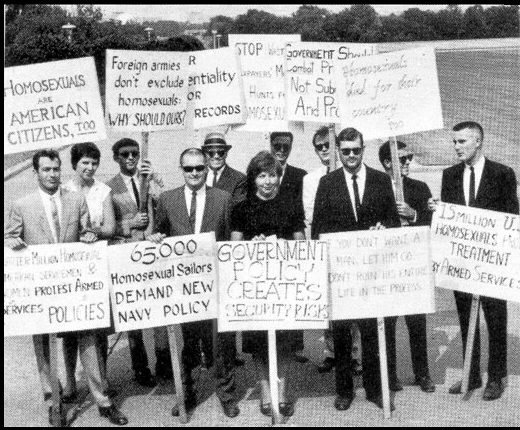 On April 17, 1965, a small group of gay and lesbian demonstrators picketed the White House in Washington, D.C., the first in a series of demonstrations staged that year by the East Coast Homophile Organization (ECHO). It was the first known such demonstration at the White House and was followed by a series of demonstrations at the Pentagon and other locations. The group, led by Dr. Franklin Kameny, was fighting for a number of goals – the repeal of anti-gay laws, declassification of homosexuality as a mental disorder, and equal treatment for federal gay employees. ECHO was born on January 26, 1962, when four organizations, The Daughters of Bilitis, The Mattachine Society of Washington, The Mattachine Society, Inc. of New York, and the Janus Society met in Philadelphia to investigate the possibility of developing an informal affiliation of homophile groups on the East Coast. At this meeting it was decided that closer communication and cooperation between the groups was desirable. ECHO affiliation [was] limited to formally organized groups operating east of the Mississippi River, whose main purpose [was] working toward the improvement of the status of the homosexual by lawful means. Paul Kuntzler said that when he and nine other people picketed the White House [53 years ago], protesting the government's treatment of gays and lesbians, he could not imagine how far the gay rights movement would come in five decades. That protest on April 17, 1965, is believed to the first gay rights demonstration, advocates say. "It was so revolutionary,” Kuntzler, 73, said. “It had never been done before anywhere in the world. We all wore coat and ties and we all had pseudonyms." "I was intrigued by the idea. But I was intimidated by all the photographers. I was only 23. And as they came across the street they started photographing us. Every time I approached the cameras, I hid behind my sign because I was unnerved by the whole thing. But I don’t think I was scared. I was very open and proud of being gay. The group was mostly fighting for gays and lesbians to keep their government jobs. Fifty years later, Kuntzler, who spent his life working for gay rights, is astonished by how the country has evolved and the strides the community has made. See full ABC News story here. Video of the demonstration can be viewed from the ABC News story. The video below shows items from early pro-LGBTQ demonstration included in an exhibit at the Smithsonian Institute along with other iconic items, such as the ruby slippers from The Wizard of Oz and Kermit the Frog. Wow, very brave people to do this back then. I'm in awe of them. It is always interesting to talk to the men and women who stood up for dignity in the years before Stonewall. Thank you for publishing this story and picture. Every one of these people was brave and courageous.